We are taking a short break with the blog over summer, but will be back on 26th August. Some of our upcoming articles: (1) European LNG reload dynamics, (2) the rise of central planning in European power markets and (3) the looming downturn in the LNG shipping market. In the meantime we leave you with a chart that summarises the divergent state of pricing in the global gas market. In the meantime we leave you with a chart that summarises the divergent state of pricing in the global gas market. 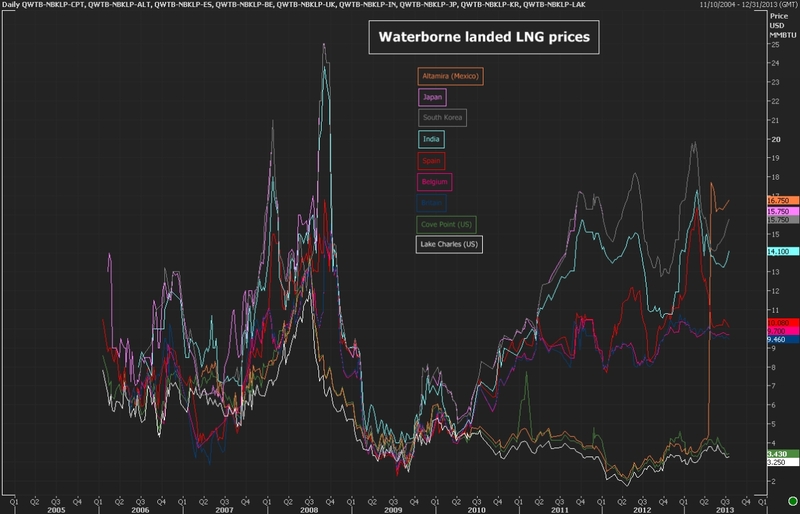 Courtesy of Reuters and Waterborne, the chart shows the landed prices for LNG at key delivery points around the world. In an historical context, the gas market’s post Fukushima state of regional price divergence is an anomaly. With Asian growth slowing, Japanese nuclear plant coming back online and US exports looming, it takes a brave person to bet against a pronounced narrowing in global gas price differentials over the second half of this decade.